‍A shopper enjoys the selection at the farmers market in Lynn, Massachusetts. A Thursday afternoon stroll through the Farmers Market in Lynn, Massachusetts, a city of 90,000 just north of Boston, offers a cornucopia of sights, scents, and sounds as well as tastes. You'll hear conversations between customers and vendors in Spanish and Khmer, and you'll see products that supermarkets seldom carry, like raw honey, corn leaves, and an astonishing variety of hot peppers. 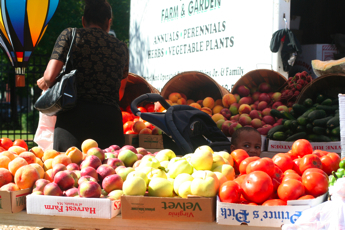 The market is a reflection of Lynn's growing immigrant population, which hails largely from agricultural countries like Cambodia, the Dominican Republic, and El Salvador. "We have vendors who reflect the cultural mix of the community," said Melissa Dimond of the Food Project, the non-profit organization that manages the market. "It means there's not a language barrier. The market has a very friendly feel; everyone is able to talk to each other." The mix of vendors at the Lynn market is one example of how today's market managers are strengthening their outreach to neighborhoods where healthy food is in short supply. Many of these innovators have used grants from PPS, supported by the W.K. Kellogg Foundation and the Ford Foundation, to experiment with new ideas and bold tactics. They are increasing the impact of markets as community institutions using three core strategies: adapting to customers' cultural preferences, improving markets through Placemaking, and reducing the cost of shopping at the market. In Lynn, a former industrial town that has seen substantial economic and demographic shifts in recent years, poverty and unemployment are at higher levels than in the rest of Massachusetts. About 7000 households receive food stamps, but until last year, hardly anyone redeemed them at the market. "Even though we had signage all season," said Dimond, "people would come up and say they didn't know we accepted food stamps." 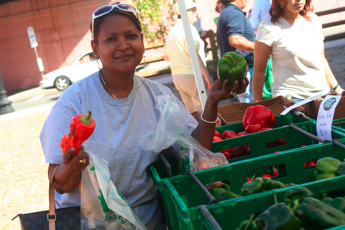 The Lynn Farmers Market responded by promoting the use of Electronic Balance Transfer (EBT), a form of food stamp distribution that works like a debit card. Customers swipe their EBT cards at the market and the price is deducted from their food stamp account. Last summer, Dimond and the Food Project launched a two-pronged strategy: adding a financial incentive for customers to pay using EBT, and marketing EBT at every opportunity. ‍Customers get more mouth-watering produce when they pay with EBT. The incentive, made possible by a small grant from a state-wide anti-hunger organization called Project Bread, gave customers one dollar of additional produce for every dollar they spent in EBT, up to $5.00. For example, if a customer spent $2.50 in EBT, they received $2.50 in additional produce. If they spent $10.00, they got $5.00 of extra produce. "That type of promotion got the word of mouth going better than anything we'd tried before," said Dimond. The next step was to make sure everyone knew about the EBT promotion. Instead of relying on signs or banners, Food Project volunteers informed every customer that EBT was available, whether they were eligible to use it or not. That helped lessen any stigma associated with EBT, said Dimond. "It got the word out, and it normalized EBT as a form of payment," she noted. "A lot more people got the message." As a result of the promotion, EBT sales grew steadily, eventually exceeding $200 per week. This summer, the Food Project offered the dollar-for-dollar incentive earlier in the season. When August rolled around, they stopped giving out extra produce with EBT purchases. The timing was by design, because it enabled the Food Project to see if the promotion's momentum would carry over once the financial incentive was off the table. ‍Customers are buying more produce at the market as a result of Placemaking improvements to the site. Sure enough, even without the lure of free produce, EBT sales have averaged $150 per week, compared to $35 per week at the start of the season. This year, the market's total EBT sales have already exceeded last year's tally, and there are still six weeks left in the season. The Food Project has complemented these outreach efforts with steady improvements to the market site, creating a livelier and more inviting venue. Once a plain vacant lot, the site has been resurfaced with pea stone and planted with flowering pear trees. The sidewalk has been repaired, and the local transit authority has fixed up the nearest bus stop. "Each year that's gone by," Dimond noted, "the neighborhood has started to feel cleaner and brighter and prettier." The physical improvements are part of a broader Placemaking effort appreciated by customers and sellers alike. For example, organizers have begun to set out picnic tables at lunch time, and sellers have started offering prepared foods like wraps, burritos, and iced tea. "People have a reason to come there for lunch and then buy produce while they're there," said Dimond. In a sign of the market's continued growth and success, next year the Food Project plans to move it to a larger, indoor/outdoor site at a nearby train station. 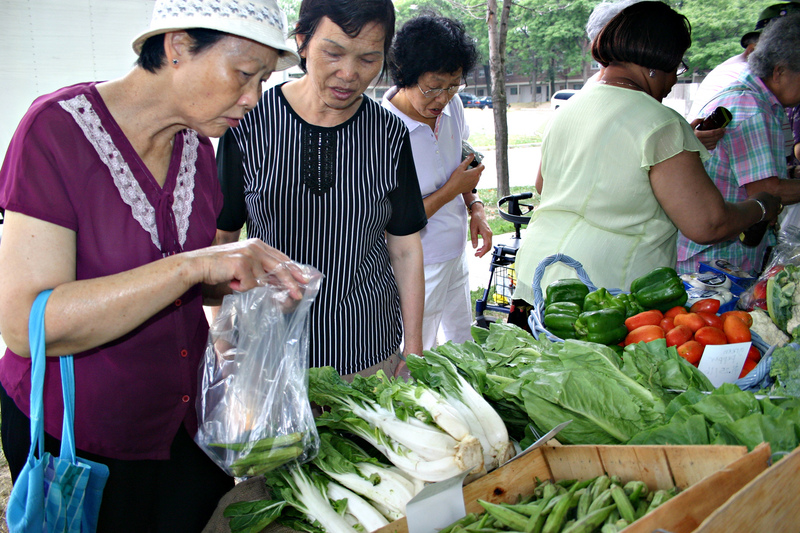 ‍Customers stock up on okra at a Good Food Market. Another method to make markets more accessible is to bring them closer to customers. That's what a Toronto organization called FoodShare accomplished by setting up small produce stands called "Good Food Markets" in low-income neighborhoods throughout the city. "Most of the farmers markets [in Toronto] are based in middle- and upper-income communities," said Angela ElzingaCheng of FoodShare, adding that the cost of traveling across town to get fresh food is "very expensive for low-income communities." 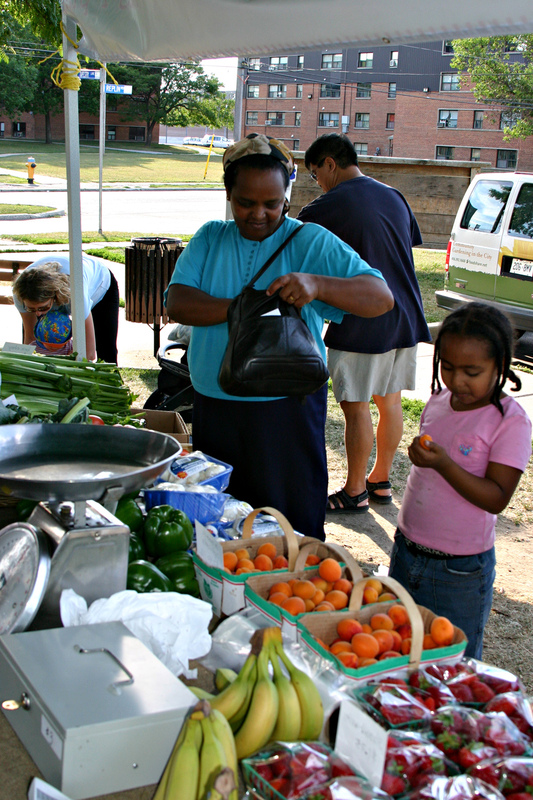 To reduce those costs, FoodShare launched the first Good Food Markets in 2005. That summer there were two locations. This year there are twelve. ‍St. 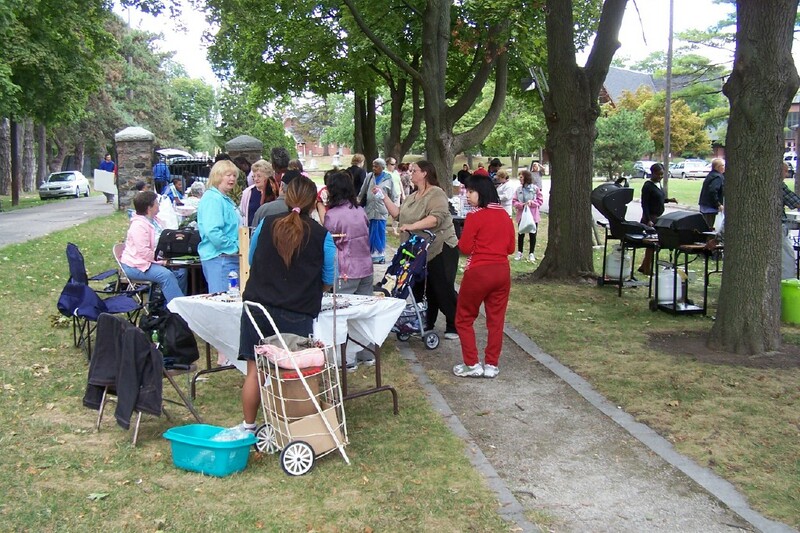 Margaret's-in-the-Pines Church hosts the East Scarborough Community Market, which includes a Good Food Market and stalls run by several neighborhood organizations. 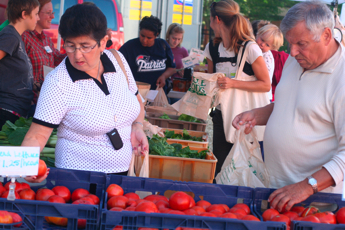 A big key to FoodShare's success has been community partnerships. The markets are located in neighborhood institutions like health clinics and community centers. FoodShare staff shows how to set up the stands and sell the produce, and the neighborhood partners organize the rest. It's been a winning strategy for everyone involved. "People are extremely excited to have this market atmosphere, and the market organizers are building relationships with people," said ElzingaCheng. "The markets are doorways to other things. People start accessing other resources." The markets serve as vehicles for Placemaking in these community institutions, sparking new activity that draws people together. At St. Margaret's-in-the-Pines Church, for instance, five community organizations have combined a Good Food Market with craft vendors, music, children's activities, and booths for local organizations, creating a vibrant public space. Another partner, the Flemingdon Community Health Center, has used a Good Food Market as a venue to support five women embarking on prepared food and catering businesses, who sell their products at the market site. ElzingaCheng believes the emphasis on public space at each market site is integral to its success. When FoodShare sets up a new Good Food Market, she shares Placemaking principles and expertise with the partner organizations that host it. "When you look at the issue of food access," she said, "the best way to address it is through culturally appropriate food, lower transportation costs, and vibrant public spaces." ‍Shopping at the Good Food Market at the Lawrence Heights Community Center. ElzingaCheng sees plenty of room for Good Food Markets to expand. "The potential for some of these markets is pretty big," she said. Some will become full-fledged farmers markets with multiple vendors, building on the strong customer base that the Good Food Markets have grown. "Eighty-one percent of our customers are repeat customers," ElzingaCheng noted with pride. "That really shows what an integral role these markets play in people's lives."